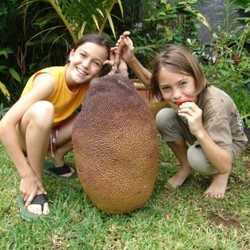 Soursop tree, AKA guanabana or Annona muricata, produces oblong fruits with spiny green rinds and juicy white flesh. 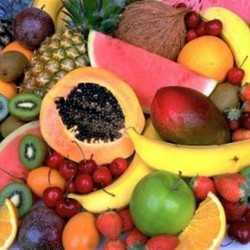 Popular in tropical drinks and sherbets, it has a somewhat acidic flavor which some people have compared to a combination of pineapple and bananas. An evergreen that can reach 30 feet and requires temperatures above freezing at all times, soursop will only thrive in USDA zones 10 through 13 or in a warm and humid greenhouse. Unlike most fruit trees, this one is usually grown from seed. If you want to try that, take the seeds directly from a soursop fruit, soak them in warm water overnight, and plant them 1/2 inch deep in sterile seed-starting mix. Keep the mix damp and they should germinate in two weeks to a month. It's best to wait until your tree is at least six months old before moving it outdoors in zones 10 to 13. Plant your soursop seedling or purchased sapling in an area with full to partial sun and slightly acidic, well-drained soil, where it will be protected from strong winds. Place it about 20 feet from buildings or other plantings, and mulch it heavily with compost to keep the soil damp, as it has shallow roots. 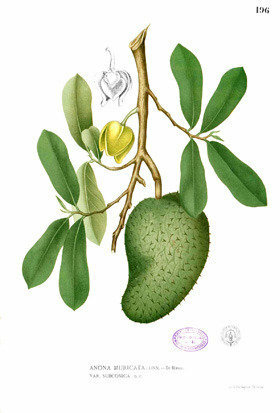 If your site is subject to flooding, choose a specimen that has been grafted onto pond apple (Annona glabra), since soursop won't tolerate standing water. 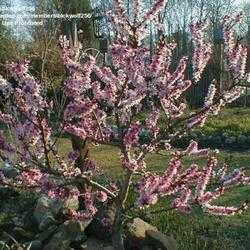 Once its trunk diameter reaches 1/2 to 3/4 inch, prune the tree back to 30 inches in height. When it begins to send out new shoots, choose the most vertical shoot to be the central leader, and three or four other shoots evenly spaced around the trunk to be the branches. After cutting off any other growth, leave the central leader vertical and force all the other branches into more horizontal positions. You can accomplish that by wedging spring-style clothespins into the crotches between them and the trunk. Feed your soursop twice a year, in early spring and early fall, giving it 1/4 pound of organic fertilizer per feeding its first year, 1/2 pound per feeding the second year, and 1 1/2 pounds per feeding every year thereafter. It's a good idea to renew the compost each year also to smother weeds and keep the soil moist. Cut back the central leader by about a third during the tree's second year. Again, wait for new shoots to begin beneath the cut, choose the best of those shoots, and force them outward to form a second tier of horizontal branches above the first. Soursop will sometimes drop its leaves when stressed by overly dry or cold conditions, so try to prevent such extremes if you can. The tree's greenish-yellow blossoms may begin to form anywhere on the trunk or branches in the third to fifth year. Pollinate those flowers by hand for the best production. You should wait to pick the fruits until they lose their shine, turn from dark to yellowish green, and the spines stand up. Enjoy them within five or six days after the harvest, or their flavor will deteriorate. In addition to eating soursop raw, you can also add its pulp or juice to fruit salads, drinks, sherbets, jams, and gelatins. The seeds are toxic, though, so remove them before juicing the flesh. 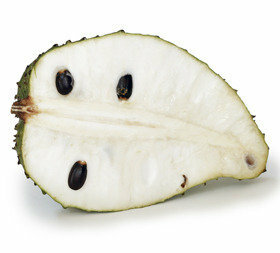 Like bananas, soursop fruits will often turn black if refrigerated, but the flesh may still be good. Cropped thumbnail and sliced fruit photos are by Muhammed Mahdi Karim, courtesy of Wikimedia Commons and this license. Antique image is from Francisco Manuel Blanco's Flora de Filipinas, courtesy of Wikimedia Commons. 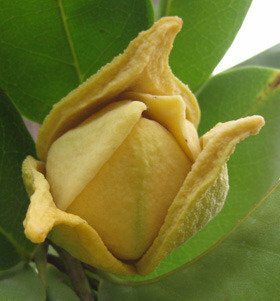 Soursop flower photo is by Tom Rulkens, courtesy of Flickr Creative Commons and this license. 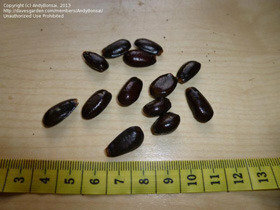 Soursop seeds photo is by AndyBonsai, from the Dave's Garden PlantFiles.